Your gift means more than words. 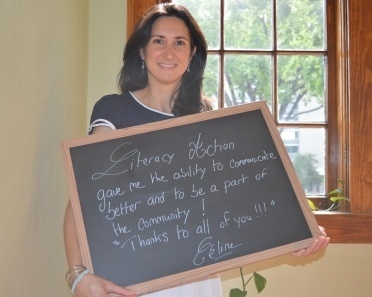 Literacy builds stronger communities by empowering individuals to achieve their learning goals. 16% of adults in central Arkansas are unable to read. With the help of hundreds of volunteers, Literacy Action of Central Arkansas provides reading and English language instruction through one-on-one tutoring and classes. Thanks to your generosity, we have made a difference in the lives of over 750 adult learners this past year. Because of you, an adult can learn to read. You will give someone the life-changing gift of literacy by donating to Literacy Action of Central Arkansas. When you check that box to make your gift recurring, you will have the option of joining the Ghostwriters, a group of sustainable supporters of Literacy Action! Literacy Action is a Section 501(c)3 nonprofit and your gift may qualify as a charitable deduction for federal income tax purposes. After each gift, Literacy Action sends a written acknowledgement of your donation in the mail, which may be used for your tax records.